After seven long years, the first model from the reborn MG brand, the MG6, has finally received a replacement. The Chinese concern with a British badge may have branched out to superminis and SUVs, but the midsize sedan/hatchback remains a key part of its lineup. Wearing the brand’s new “Sensibility” design language introduced on the E-motion concept, the MG6 features a rather sleek fastback look with a steep rear windscreen rake. At the front are sharp headlights framing a “Star Rider” diamond-studded grille, bearing a striking resemblance to the Mercedes-Benz A-Class. Along the side the side a prominent shoulder crease flows into the punchy rear haunches. Moving to the rear, there are “Ambilight” tail lamps with twin light guides, as well as a diffuser with twin exhaust exits. Sequential LED indicators are also fitted. The cabin is quite attractive, with a leather-wrapped dashboard, a driver-focused centre console and round air vents akin to what you’ll find on an Audi A3. There’s a distinct absence of switchgear – many of the controls are grouped in the large touchscreen belonging to the Zebra 2.0 infotainment system. Utilising Alibaba’s YunOS, the system features more advanced voice control, remote control and intelligent maps. 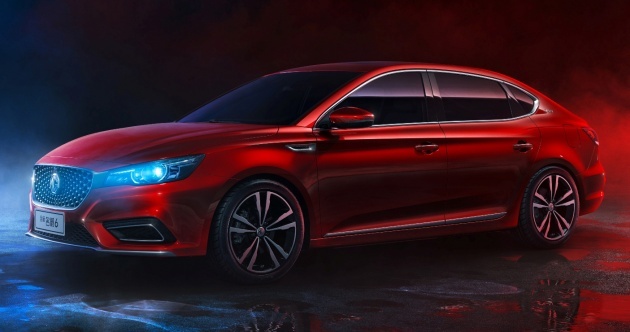 No details as to what is under the bonnet, but Chinese automotive portal Autohome reported that the MG6 will feature a 1.5 litre turbocharged petrol engine with 169 hp and 250 Nm of torque, paired to a seven-speed dual-clutch transmission. The MG6 will go on sale in China in November, and it will also take a second stab at the UK market next year – the outgoing model was discontinued last year amid poor sales. A solid effort by MG/SAIC (the interior being the most impressive). But for the Europe market & rest of the world, the rather fussy looking A-Class inspired diamond grille has to go.